Lots of colour. Lots of action. Chaos ! I love it. 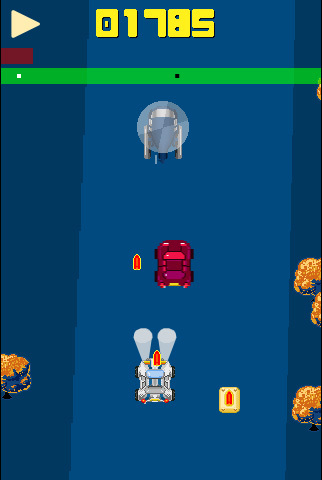 Writing a simple arcade game for a handheld device (and even then to be executed through a web browser) is quite different from the luxury of writing for the desktop. Not only do you have to consider the scale and colour of everything but you have to be careful with just how much you throw around. I no longer use DIVs and IMG files instead opting to use the Canvas element courtesy of HTML5. When I first started writing with the iPhone in mind I thought I had run in to some serious canvas limitations. I was essentially doing the same thing with the same routines but somehow the approach seemed to yield a far lower frame rate. It didn’t make sense to me since iPhone is pretty powerful, right ? I scratched my head. Could it really be that wiping the entire screen and then redrawing everything (regardless of whether it has moved) was such a drain on the device’s performance ? I certainly didn’t want to go to the trouble of detecting which sprites occupied certain regions before clearing the canvas down. Besides that would probably be an even bigger ask. But the it dawned on me that my methods were not ideal. When I populate the game with entities I essentially pick them from a pot. During initialisation I build arrays of entities. In most cases for things like explosions I create a pot of about 50 objects. Same goes for alien bombs and player lasers. I also tend to throw around spark effects and various other niceties. When the game loop requests such an entity it enters a loop and looks for the object that isn’t currently visible. Where there is a lot going on on-screen this can stretch to pretty much the array length. When it finds an object to use it simply breaks out of the loop and returns the object. In total I was probably asking my game loop to step through an array of around 300 elements 20 – 30 times a second. I then pass these objects in to the relevant method – draw(), move(), collision() – and have each method handle the situation in its own container. Where the object being passed is not visible (i.e. it’s been destroyed / picked up, left the screen boundaries or hasn’t yet been used) I simply back out of the method. This works well and obviously saves a huge amount of crunching when you’re trying to perform the same actions several times a second. So I put together a couple of tests. In one corner I had my current and unedited game file. In the other corner I had a new game file with the array sizes drastically reduced. A small and insignificant changes you might think ! Both files were running flat out. I ran them both and took the diags. Both were running in Firefox 3.6. The first file gave me around 77 FPS. The second (with the reduced array sizes) gave me around 90 FPS. I’ve yet to test this on the iPhone but I would hope to see frame rates increase from the 16 – 18 FPS that I was experiencing earlier. 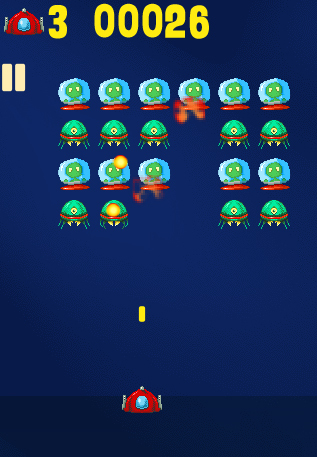 Something around 25 FPS ought to be acceptable for a simple Space Invader game. I’m rather pleased to see this since the alternative was alter the game’s design. It’s important for me to have plenty to shoot at. The first thing to go would have been the fancy sparks and screen full of entities. Never the aliens and explosions. I also took the decision to reduce the amount of lasers that the player can launch and have on screen at any one time. It’s not ideal but will probably make for a more intense game. Finally I dropped the alien bomb pot from 30 to 4. Only 4 alien bombs on screen at once ! To counter this I ditched the idea of an energy bar that gets depleted with every hit from an alien bomb. Instead I went for the classic one hit and you’re out a la Space Invaders / Galaga etc. Again this tends towards a more intense experience. So all in all a worthwhile exercise. It sets me up a bit more for crafting such games for mobile devices. Something I needed to do if I’m to maintain the amount of games I’m hoping to produce each month. During the crafting of my Gauntlet-esque game I lost some motivation. The issue of rotation vs collision took its toll. I needed something to just jump in to so that I could get a game completed. It’s hugely frustrating for me not to finish something once I set my mind to it. So I took a look at the iPhone. I’d looked at Objective-C and scratched my head enough to ask the question “Can I make games for the iPhone without Objective-C and Cocoa ?”. So much infact that I punched exactly that in to Google. When it came I devoured it. It’s not a big book but gives you every bit of markup and code that you need to present a game in an iPhone / iPod Touch. Safari Mobile is sturdy and executes at a good pace. I tested the game using desktop Safari on a PC and my wife’s iPod Touch. Although the framerate drops on the actual device it’s certainly good enough to present a good game. I didn’t waste too much time on game design issues. I pretty much knew from the outset that I wanted a colourful game with a wizard battling another evil wizard in a fixed arena. I wanted the game to feel nice. When you touch the screen the character moves to that point. I also reflected the target position using a simple red blob sprite that fades over time. The effect when you drag the wizard is quite pleasing if totally accidental. As a GameBoy artist I learnt very quickly that colour is vital. Bright, vibrant colours can make a simple game experience really enjoyable. So I set out to create bright colourful sprites. The easiest way to achieve this was to wash out the backdrop. So I set the entire game on a patchwork stone floor that is actually quite dark. I then crafted a bunch of sprites using the opposite end of the spectrum. The effect is very nice and rather rewarding for an artist / game designer. When I first set out to create the game I was concerned about frame rate. I needn’t have been. Safari Mobile handles things nicely. So much so that I was able to spawn my trademark spark flashes all over the place. The process of picking gems and stars up is dull if you don’t visually reward the player. The 8 way explosion of sparks is perfect feedback. I also invested some time making this bob and bounce a little. So stars, gems and bonuses don’t just appear they drop a short height and bounce in to position. Very little code used for a thoroughly worthwhile effect. I hope to blog a bit more about the game’s development once it’s complete. Just now I’m wrapping up the sound issues (AUDIO tag) and tightening up the code and resource files. I’m desperate to keep the whole project under 300k. Have a look at the game. You can play it on a PC using the mouse to click the arena or the keyboard arrow keys to move the wizard.